Getting the best deal on business technology will take some research and careful planning. Sticking to a budget is vital to ensure that overspending does not occur. Small start up businesses should also look at leasing options rather than buying their technology outright. The market place for technology is a huge one, and there are great deals to be had when it comes to business technology. Prices on technology have fallen drastically over the past few years and knowing where to shop should reap rewards. Most technology suppliers will have cheaper prices for the business customer, and VAT can be claimed back on goods. If it is technology equipment that is needed for the small business then cash and carry stores should be considered. Businesses owners must register with these stores, but once registered there are significant savings to be made. Technology such as computers, mobile phones, televisions and presentation screens are all much lower in price at cash and carry stores. A simple Internet search of cash and carry stores should bring up the nearest store in your location. Negotiating with suppliers is a must regardless of which technology that is actually needed. Suppliers should be willing to haggle on the prices that are advertised in-store. If you can show that you have seen a better deal elsewhere, for example on the Internet, then show this to the supplier. They should be willing to lower their prices to either match or beat competitor’s prices. For the supplier it makes good business sense to offer a lower price; they will have made a sale and have hopefully gained a repeat customer. 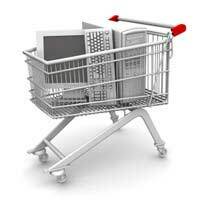 There are great bargains to be had when it comes to shopping for technology online. Internet only suppliers have fewer overheads and can usually offer lower prices. Most of the online technology specialists will be able to offer better advice and information on equipment than salespeople in stores. They will usually also have dedicated help lines should any problems occur with any equipment. They should also have express repair facilities where faulty goods can be picked up from the business premises and delivered once repaired. Technology requirements should take up around 2% of an annual budget and sticking rigidly to this budget is important. Buying technology will not always be an option for many start up businesses. Leasing equipment will be cheaper and there are also tax benefits to be had on leased equipment. With leasing you know exactly how much you are paying each month, repairs should be free of charge and technology upgrading options should be included. Buying may be cheaper in the long run but upgrading technology can be expensive and is not usually cost effective. When it comes to communications technology the amount of companies offering great bargains can be confusing. Shopping around online should guarantee that you will find the best telephone and Internet deals to meet your business requirements. Your local high street communications seller may offer what seems like a great deal but Internet only suppliers may be able to beat these rates. Good communication technology deals will be those that offer the best equipment at the best price with good IT support. Business should also check the extra options available from their communications suppliers. Always ask whether they have IT support that is available free of charge to their business customers. Also ask if they have emergency repairs guarantees, and enquire on their policies on upgrading equipment. All of these requirements should be met before any contracts are signed. Getting the best deals on technology doesn’t mean taking the cheaper option; it simply means finding a bargain. However, sometimes paying that little bit extra will mean a better support service from suppliers. Businesses should always carefully consider the technology they actually need and then research their pricing options. Negotiating technology prices should reap rewards when it comes to getting the best deal available.